Most of you familiar with the work of Michael Mukasey probably remember him as the federal judge who granted Jose Padilla, an Al Qaeda agent designated an enemy combatant by the Bush administration, access to counsel during his detention in a U.S. military brig. Others might recall his refusal to declare waterboarding synonymous with torture during Senate Judiciary Committee hearings prior to his confirmation as Attorney General. However, the defining moment of his legal career was his oversight of the trial of the 1st World Trade Center bombing conspirators, led by The Blind Sheikh, Omar Abdel-Rahman. It was this historic trial, as well as its implications for American society, which was the primary focus of Judge Mukasey’s speech to the Gertrude and Morrison Parker West Side Republican Club this past Tuesday. As he explained to a standing room only audience, this criminal conspiracy case was a milestone in our nation’s history, because it marked the first time that we learned of a jihadist cell bent on sowing terror, fear and destruction on American soil. Unfortunately, the lessons gleaned from that trial were largely lost on the immense federal bureaucracy ostensibly charged with protecting the lives and security of American citizens. While the FBI ignored the ties Egyptian-born El Sayyid Nosair, the assassin of Rabbi Meir Kahane, had to jihadists both domestically and internationally-2 of the conspirators in the 1st World Trade Center bombing were present at Kahane’s murder-it likewise disregarded the links between the ’93 conspirators and Islamic terrorist networks abroad. Just as the failure of imagination and lack of moral clarity in Nosair’s prosecution set the stage for the 1993 WTC bombing, so too did the trial of these jihadists allow the 9/11 plotters, specifically the mastermind of the 9/11 massacre and cousin of Ramzi Yousef, breathing room to plot future acts of spectacular terror. 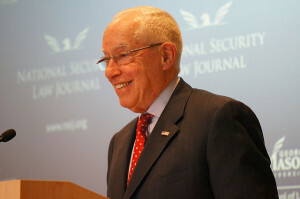 The question is why this was allowed to happen, and Judge Mukasey’s unequivocal answer is that it occurred because the institutional powers tasked with confronting this threat decided to ignore the connection between the tactic of international terrorism and the religious ideology which it serves. There was, as the former prosecutor of Sheik Rahman puts it, a willful blindness to the practical consequences of Islamic dogma, which is drawn from Islam’s sanctified texts. Texts with which our government is not only ignorant-and thus, unprepared to combat-but which are antithetical to our public officials’ increasingly absurdist pronouncements about Islam, which they view as a religion of peace and love. The logical conclusion to this bizarre inversion of reality can be found in an article published by The Atlantic, which posits that even without Islam the Islamic State would still exist! An article shaped, it should be noted, by a former consultant to the Obama administration who publicly justifies the oppression of women that have had the misfortune of being born into Islam. Is it any wonder that when this same organization calls for the destruction of our nation’s crops and eradication of its food supply the media make no connection between that fatwa and the words ostensibly uttered by Mohammed, the ideal man according to Muslims, which justified the same type of war crime in 7th century Arabia? The disconnect between the apprehension felt by ordinary citizens, and the increasing body count of infidels, and the rose-colored view of Islam painted by our government and its media courtiers has never been broader. Although this gap can be seen throughout the federal government, from the FBI and the Department of Justice to the White House itself, it is most acute within the State Department. A government agency charged with expediting the resettlement of 10,000 unverifiable Muslims from Syria, but which refuses to countenance the idea that the precepts of Islam might have anything to do with the thousands of terror attacks which occur every single year around the globe. An agency which used the aftermath of the Brussels attack to remind Americans that Islam has nothing whatsoever to do with the massacres committed explicitly and repeatedly in its name. Even as the tangible connection between Islam and global terrorism becomes inescapable for most observant human beings-even those, like Abdel Fattah al-Sisi, who lead Islamic nations-the powers that be refuse to acknowledge the synergy between these two forces. All of the inexplicable actions taken by the Obama administration, from its brief flirtation with the idea of releasing The Blind Sheikh from incarceration, to its embrace of the Muslim Brotherhood as a negotiating partner-going so far as to host a Brotherhood leader at the White House-to Attorney General Loretta Lynch’s vow to punish anti-Islamic speech make sense when viewed within this context. As Judge Mukasey pointed out throughout the course of his speech, the paradox of people who are considered to be dirty kuffar shaping our approach to Muslims, particularly those whose violent actions they are seeking to curb, is completely lost on our policy-makers. Hence, the proper Islamic burial of Osama Bin Laden. The folly of entrusting our national security to those who hold purportedly enlightened views of Islam can be seen most starkly in Europe, which is currently being devoured by Islamic refugees, many of whom were created by the presumptive Democratic nominee and Koranic expert, Hillary Clinton. Europeans are supposed to have faith in their leaders’ judgement, the same leaders who decided it would be a good idea to place Iranian refugees in charge of Arab-Muslim refugees, with predictable results. As dispiriting as the current state of affairs is, Mr. Mukasey has a number of recommendations which might point us in the right direction, vis-a-vis defeating Islamic terrorism. For one, honestly and openly name the problem. Challenge elected officials, and to the extent possible, bureaucrats, who continue to deceive us about the connection between terrorist attacks by jihadists and the Islamic doctrine which inspired them, even if only indirectly. Obfuscation and denial will not get us any closer to resolving one of the most dire problems facing Western civilization. He also suggests building bridges to genuinely secular, liberal Muslims domestically, while encouraging diplomatic cooperation with anti-jihadist leaders abroad, such as President Sisi in Egypt. Whether these steps will ultimately succeed is dependent upon our ability to influence those who wield power. Unfortunately, it looks bleak on that front, as our benevolent rulers continue to portray Islam as force for good in the face of overwhelming evidence to the contrary. However, hope springs eternal. As long as there are ordinary American citizens, as well as distinguished officials such as Judge Mukasey, willing to speak the truth, I’m confident that the values inculcated by Western civilization will not pass from this earth. This entry was posted on June 9, 2016 at 4:43 PM and is filed under Analysis, News, News and Analysis. You can follow any responses to this entry through the RSS 2.0 feed.